God has done SO much through the JESUS Film Church Planting Strategy in the last 12 months! It is such a privilege for us to sit in the front row and see all that He is doing! 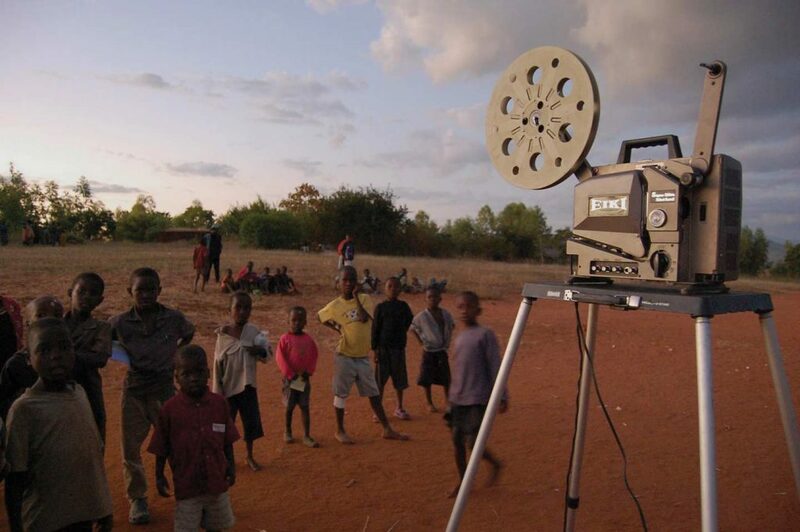 One key example is in Sierra Leone: the JESUS Film has been shown 150 times there to 21,000 people, and 3442 individuals have made decisions to follow Christ! There have also been 76 new church plants, 336 church leaders are being trained, and 1,414 people are engaged in follow-up discipleship groups. Altogether during the 7 years our 4 teams have been serving in Sierra Leone, more than 36,000 people have accepted Jesus as their Saviour, and 515 churches have been planted, in spite of – or perhaps due to – the Ebola Crisis. All glory goes to God for being faithful to His Word! Neighbouring Liberia has also been open to hearing about Jesus. 23,150 people saw the JESUS film at 76 showings, and 932 made decisions to follow Christ! There were also 38 new church plants, 116 church leaders trained, and 670 people are involved in follow-up discipleship groups. In Ethiopia, we showed the JESUS Film 33 times to 8700 people; 707 people made decisions for Christ, 602 people are in follow-up discipleship groups, there were 33 church plants, 4 new churches built and 92 church leaders trained. Of the 900 people who watched the JESUS Film in Mexico at 24 showings, 236 made a decision to follow Christ, 230 are in follow-up discipleship groups, there were 13 church plants. It’s amazing how many personal testimonies we have been blessed to hear from people who have watched the JESUS Film and been encouraged to follow Christ! of Southern Sierra Leone, stand in front of their church building. Once individuals make a decision to follow Christ, they need a church fellowship to call home, which is a key part of our strategy. Since 2009, 12,991 people have been trained in our church planting follow-up action groups, which has led to 714 new church plants and discipleship groups, and 128 built churches! 22,147 adults are engaged in follow-up groups, and 677 adults have taken pastor training. Thank you Jesus! Despite all of our efforts, today there are still 343 Unengaged, Unreached People Groups (UUPGs), approximately 8.5 million people, who are beyond the reach of the gospel, spiritually lost with no church, no mission agency, and no one who has yet taken responsibility to tell them of our great God and Saviour, Jesus Christ. Thankfully the Lord answered our prayer in 2018 to reach more unreached peoples with the gospel! In February, we applied for a funding grant for four new church-planting teams, two in Liberia and two in Sierra Leone, towards our goal of reaching unreached, unengaged people groups worldwide. One particular tribe, the Krim or Bum tribe, in Sierra Leone’s Pujehun District is completely unreached. 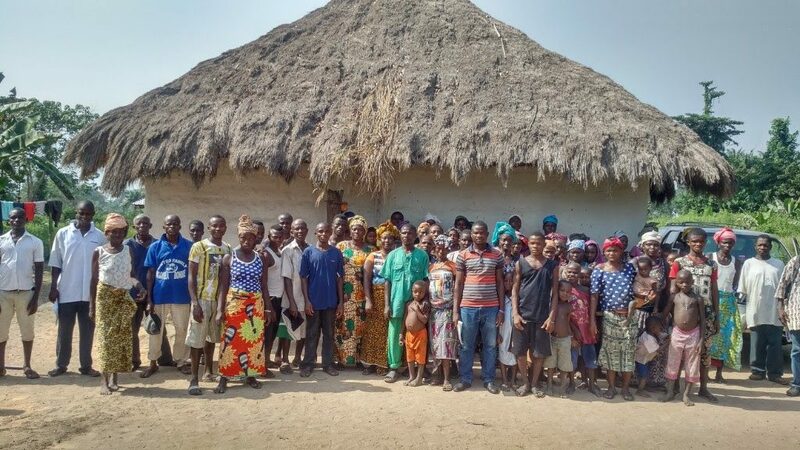 In mid-September, after much prayer, we received confirmation that the grant had been approved to reach Pujehun and its surrounding area as well as Kenema, an under-reached area of Eastern Sierra Leone. After the brief celebration, we quickly came to terms with the additional amount of work we now face, but it is certainly a great problem to have! trains pastors gathered from the Pujehun District. 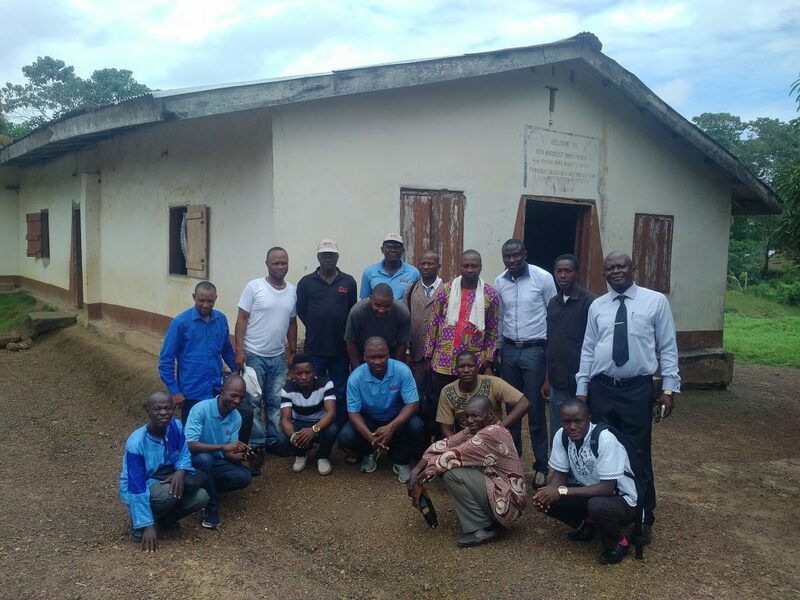 George Mbayo, our Sierra Leonean coordinator, traveled to the two new regions to scout for potential partnerships, and had this report from Pujehun District where he met with several pastors and church leaders. I want to thank God for the successful trip to Pujehun Town. There is a pastoral council with ten registered churches and others are still joining. 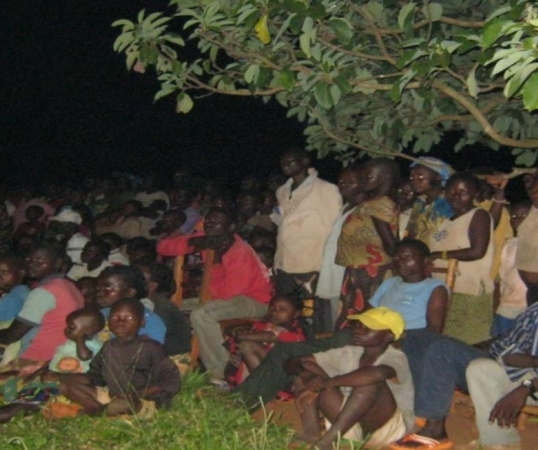 The JESUS Film Church Planting Strategy coming to the Pujehun District was an answered prayer. The entire Pujehun District is virgin ground for church planting. There is high demand for establishment of churches in various communities. Pastors and church leaders are all willing to plant churches. the training. We are grateful for such a committed group of pastors! 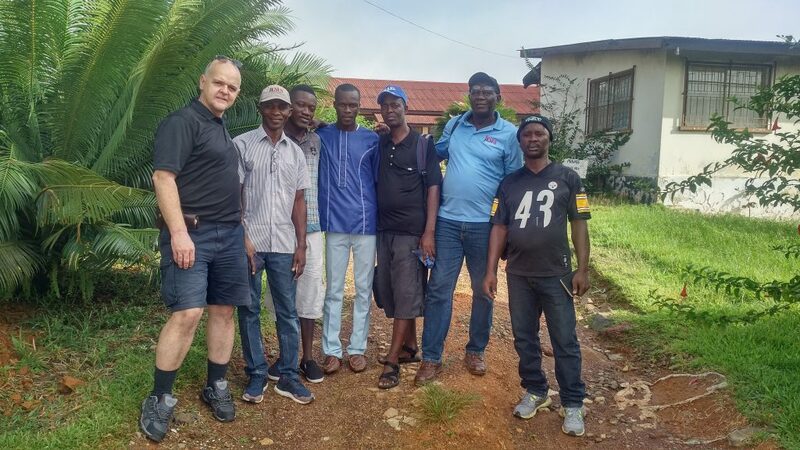 Church Planting Coordinator Peter Koteles traveled to Sierra Leone in late October and early November to train team members to begin four new church plants in partnership with local churches who want to penetrate their respective districts! 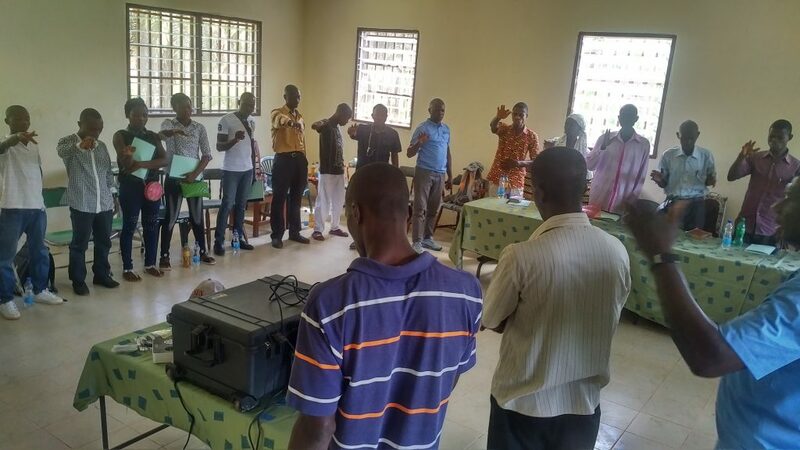 In the first week after training, the Pujehun team was already positioned to plant two new churches, and the Kenema Team was planning four church plants. Both teams are off to a great start! 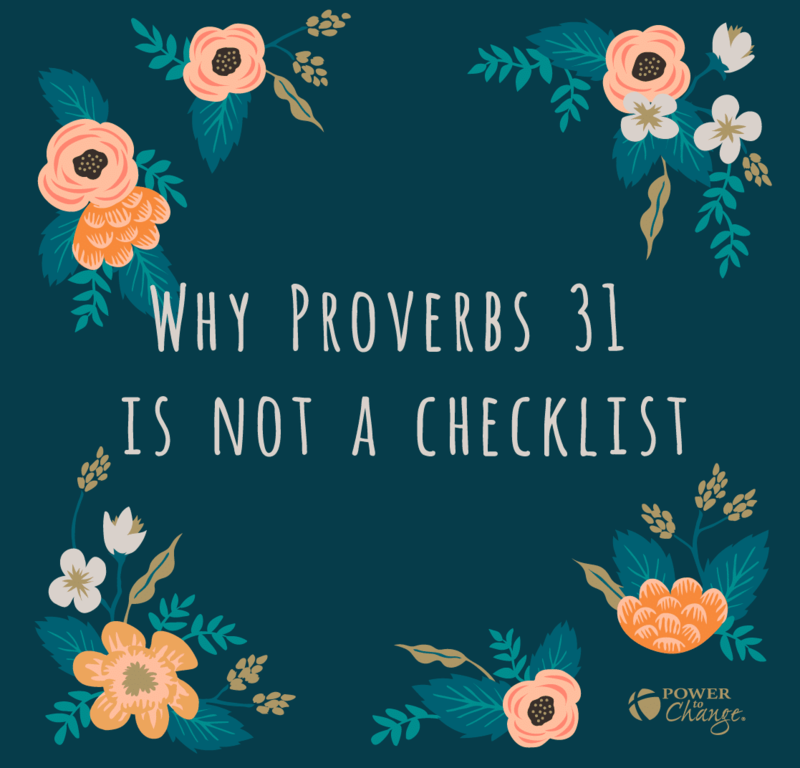 Please pray with us for for wisdom, protection, and fruitful ministry as they begin reaching into some uncharted, dark territory. 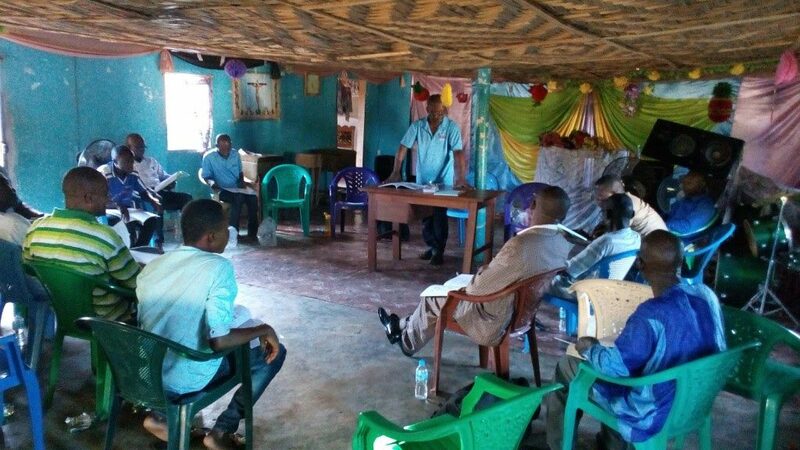 Two new teams were also positioned to begin church-planting activities in Liberia’s Mano region in December. In partnership with the same UUPG organization, we are reaching the Mano tribe, another unreached people group. Providentially, the JESUSFilm was just recently translated into the Mano dialect! Given improving technological capacity, rapidly growing numbers of translations of God’s Word, and prayer behind each of our ministries, it is exciting to think about all the Lord can accomplish through us as we partner together to work in His harvest field!